While waiting for Mr White's response, Dolores' solicitor/executor Joseph Bowe sent the beneficiaries of Dolores' estate correspondence that alarmed Saoirse. She wrote a 2nd Letter to Beauchamps' Partners, informing them of the concerns she had with Mr Bowe's correspondence. John White did indeed write a letter to Saoirse on 11 July 2013, ostensibly in reply to both of the letters she had sent the partners. Except, well, he addressed exactly ZERO of the issues raised by Saoirse to the partners. This letter is published here, followed by Saoirse's response, once again sent to all of the partners at Beauchamps. well-documented and serious concerns is extraordinary. Your response to the serious issues I and others have raised was less than I had hoped for from Beauchamps. It is, sadly, exactly what I expected. Nonetheless, I felt it was a prudent and decent thing to write to you and the other partners to allow all of you the opportunity to address things in–house. Of course your letter addressed not even one of the issues surrounding Mom’s estate or the level of service provided to my parents and my late uncle Patrick Maxwell by your firm. Would it not be better for all concerned (including yourselves) to show how the issues I and others have raised were unfounded? Given your view of Mr Bowe acting honourably and honestly this would seem to be a simple thing. I think we both know why you cannot do this. Was Mr Bowe acting honestly when he informed me in 2011 that he had appointed outside solicitors to administer Mom’s estate? Or was he lying once again? It can’t be both, Mr White. In the early stages of the administration of Mom’s estate, Mr Bowe was unable to discover Mom’s safe deposit box. I subsequently discovered it for him and requested I be allowed to be present with an independent party when it was opened. Mr Bowe readily agreed to this. Was Mr Bowe acting honourably when he travelled to Wexford a few days later to open the safe deposit box, and scheduled an email to be sent to me hours after he left the office, informing me that by the time I read the email, he would be at the bank in Wexford? Do you consider that behaviour to be honourable, Mr White? Would you consider Mr Bowe accepting and acting upon instructions issued by his client Onan Maxwell concerning the affairs of his client Dolores Maxwell to be a “high level of service” provided by your firm, Mr White? You state in your letter: “The subject matter referred to in your letters has already been the subject of a complaint by you to the Solicitors Disciplinary Tribunal.” Not entirely, Mr White. Many of the issues raised have come to light or have happened subsequent to the Tribunal action. Nor has the SDT’s decision of “no prima facie evidence of misconduct” dissuaded me for an instant from seeking justice and accountability for those who treated Mom (and now her estate) so horribly. How could it? 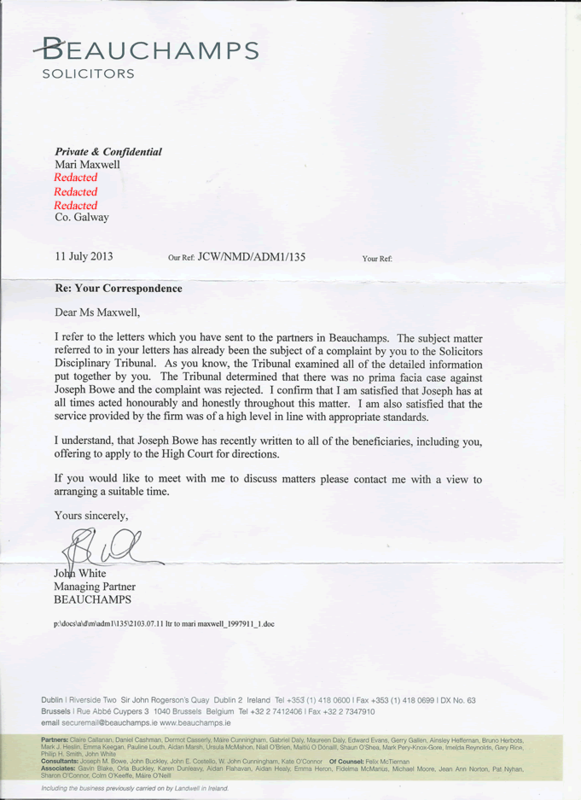 For instance, my complaint to the Tribunal concerning a threatening letter sent to my brother by Beauchamps was countered by Mr Bowe in a response that never even mentioned the letter in question. Rather, he put forward a letter written some 10 months previously that had nothing whatsoever to do with my complaint. Yet the Tribunal said that he had “adequately rebutted” that specific complaint. That’s just one of many bizarre examples from the SDT. Nor did the fact that Mr Bowe repeatedly lied to me and perjured himself to the Probate Office, Revenue and the SDT itself seem to trouble them at all. No, I think the SDT’s decision revealed much more about them and the folly of your profession regulating itself than anything to do with Mr Bowe’s misconduct. Please don’t tell me I should have appealed. The judge who currently decides these appeals has never granted relief in such an appeal. You have to go back to the last century to find a successful appeal in this regard. We shall see if my sister [Redacted’s] complaint to the Law Society against Mr Bowe gains any traction. As you know, at the time of my complaint, the President of the Law Society was John Costello, who is in your employ, which is one of the reasons I chose to go to the Tribunal. Mr Costello is now the Senior Vice-President of the Law Society, and I shall be watching developments with interest. Mr White, you state that Mr Bowe “offered” to apply to the High Court for directions. Actually in his letter he “proposed” to do so. As I have explained before, Mr Bowe’s previous history of “proposing” to do something ended with him doing nothing at all. Has he done anything about the latest “proposal” made over a month ago? Thank you for your offer of a meeting with you, and provided that you will commit yourself to honestly addressing some of the issues, I would love to have a meeting with you. The charges lodged against Mom’s estate assigned to a company that denies ever doing work or invoicing either Mom or her estate. The charges against Mom’s estate for specific items that she had paid for (or had been forced to pay for) months before her death. The charges against Mom’s estate by one of the executors to pay for his own personal liabilities. An explanation as to why it has been well over a year since Mom’s last asset was disposed of and the executors have still not issued a statement of accounts or disbursed Mom’s estate to her beneficiaries. A complete account of Mr Bowe’s efforts to contact the witnesses of Mom’s current will – one who said he had never seen or signed it, and the other who could not say if Mom signed it in her presence. An explanation of and plan to address the omissions on the Inland Revenue Affidavit filed by Mom’s executors. So yes, Mr White, if you will commit yourself to an honest and open discussion to address at least the above, I would love to take you up on your offer of a meeting. If you would seek to use the meeting for further stonewalling concerning these issues, then I have no interest. In closing, I note that many of the issues that have been raised concerning Mr Bowe’s representation of Mom, Dad, and my uncle Patrick are the very same ones that his elderly client Elizabeth Murphy raised, and that the Supreme Court found issue with. You must have been very relieved when Mr Bowe’s client died two weeks prior to the Supreme Court’s decision, I expect in much the same way that Mr Bowe was relieved when Mom died and he did not have to try to register Mom’s flawed EPA that he prepared for her – the one with the non-existent doctors’ names scratched out and written over. Was this EPA another example of “the service provided by the firm” being “of a high level in line with appropriate standards”? I had hoped that what I view as Beauchamps’ disregard for the interests of its elderly and vulnerable clients was confined to the Maxwell family. It appears, unfortunately, that a pattern is emerging. I have copied this correspondence to each of the 23 partners and www.dolores-maxwell.com.